After waiting for far too long for one of these to be in stock, it finally arrived about a month ago. Had to actually finish a few things first but I actually sat down yesterday and got some progress. Bearings came in today so the rolling chassis is complete. I did another time-lapse of this one just like the Agrios, changed to a shot every 1 second instead of two. When the video is compiled I will put it up in here. Until then, here is a teaser of the cab mounted with the version 1 mount (its the green thing in the first pic) which as of now does allow the cab to tilt forward. Still need to draw up and print a rear body of I guess a support truck or a race truck, not sure which one yet. If you guys have any good 6x6 subjects to share I would love to see em. Cab is a Mercedes Actros 4143 for subject material. Also to do is re-profiling the front wheel cutouts and design/print off some flexible fender flares and or mudflaps. I might end up making some wheels as the aluminum set in front looks better proportioned to me and are approx 5 mm larger in diameter than the plastic set. The tilt cab looks great on there. Also agree on the wheels, the fronts look really good. This is what the dynahead should have been all along and not the yorkie easter egg box it turned out to be. this one has an interesting history, it was an impostor race team smuggling drugs to a port. 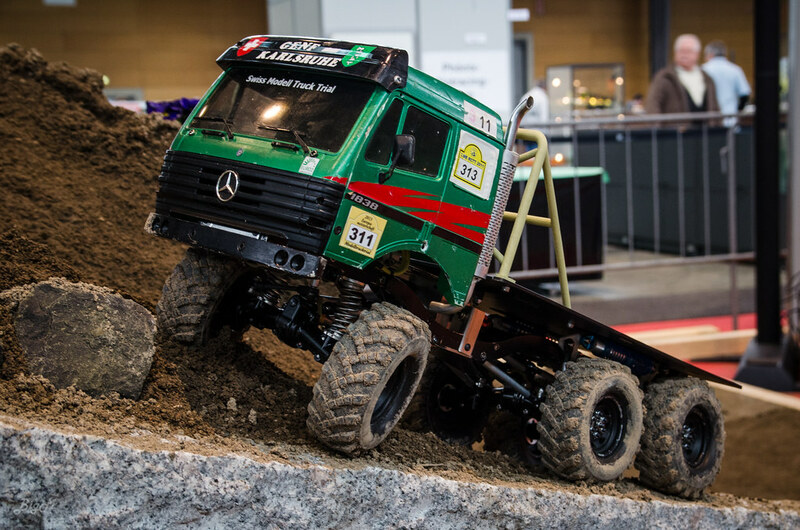 This is also a Merc but only two axles, the rear box has that gradual taper that is probably most recognizable. Then there is this one, Maybe PDC took some liberties with this one, a whole lot more complex though, an '88 DAF X1 Turbotwin. I like all three examples, last one is pretty cool and haven't seen that before. I assume you're custom making the rear bed? Got the truck all together and wouldn't you know it it was raining so all I could do was test a little bit in the garage. Neat truck though, goes over everything. Once it dries out here I will have to go for a proper drive. I am thinking that I need to move the cab back around 20mm and up around 5. At 20mm the back of the door will be nearly centered on the axle. Right now, with the current approach angle, a 75mm ledge will contact the body before the tires. 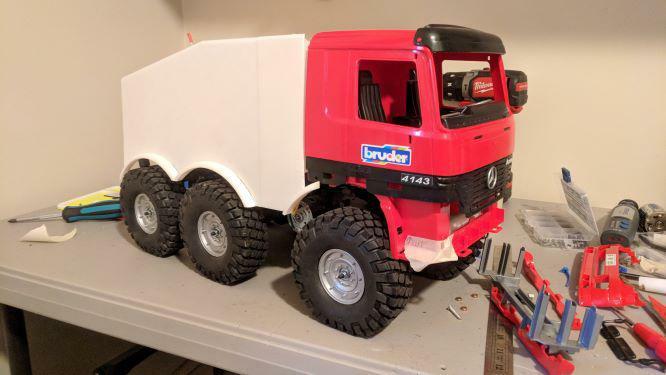 These Bruder bodies are neat. I had hoped that I could disassemble the relevant bumper pieces and just keep what I will need. Instead it looks like I need to trim the body up to at least just below the second step. Got the cab moved back to where I wan t it. I am using some mounting buttons molded into the cab for mounting it. 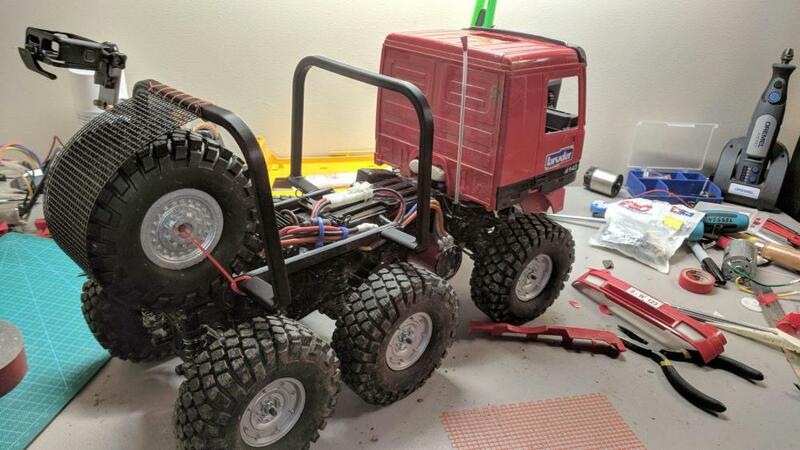 I wound up moving rearward 25 mm and up by 10 mm, the rear of the doors are now slightly behind the front axle which seems most appropriate. 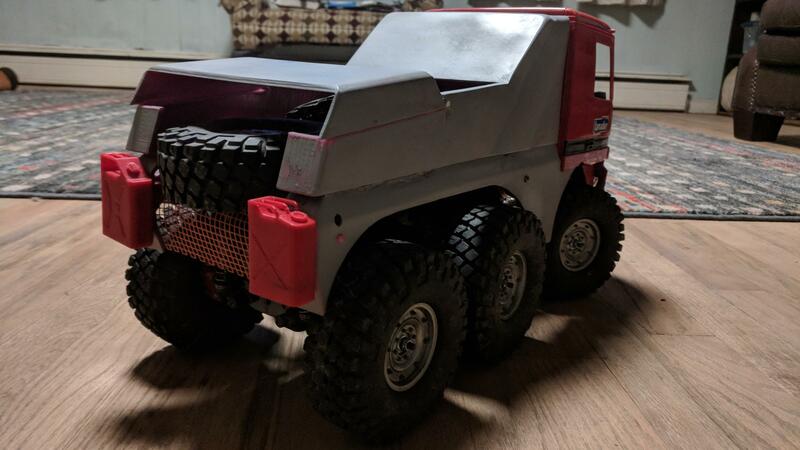 I printed the rear piece with the flares built in. Flares are 8mm wide and nearly cover the tires, perhaps 4 mm of tire sticks out. Humvee wheels are painted silver and though not as pretty as the aluminum set, will do for now. 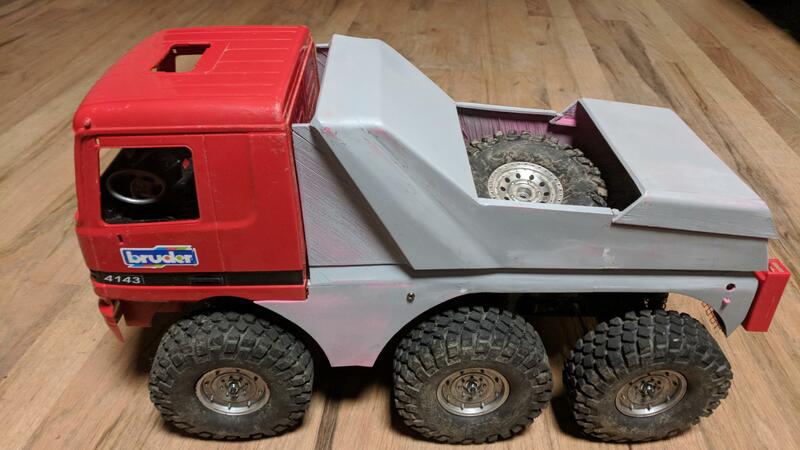 Still torn on what to do with the back half, without paint and sponsor decals it looks like a off-road garbage truck to my eye. I am pleased that the motor is less exposed with some cladding but I could do the same with a flatbed style as pictured further down, not sure yet what I prefer. 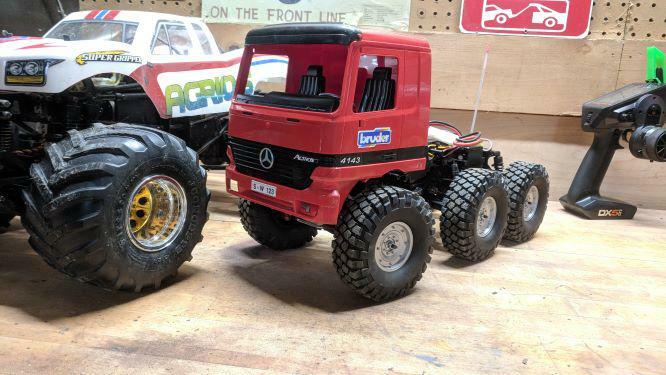 I haven't had much luck in finding a group with a lot of pictures of this style of RC to peruse for ideas. 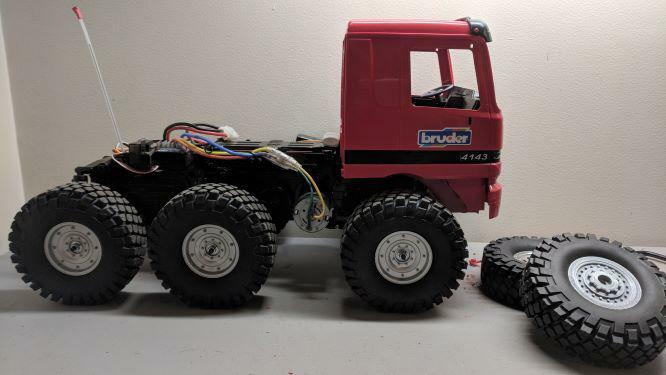 I did find a neat video of a CR01 based 6x6, apparently stock parts can be combined to make the middle axle for both an input and output shaft if one were so inclined. I would have to look for the link. Made some more progress, Painted the Humvee wheels, still look too small. Designed and made a test part of a scale LMTV military 20 inch wheel. I hope it will look better once painted and detailed. Trimmed the body back, took a bunch of footage for a part 2 video on YouTube. Wheel wells now clear with room for flares under all suspension and steering movement. You can see a hint of the new wheels as well. Render attached for comments or improves the new wheel is slightly larger than the aluminum at the sidewall and about 28 mm wide for a less ballooned sidewall. Truck at top of cab is a substantial 260mm tall at this point, Agrios for scale. More work done on the Dynahead since last week, I relocated the receiver to under the cab, helps in making the wiring just a bit more sanitary. Last two days I have been designing the parts of the rear cage and learning how to print netting. 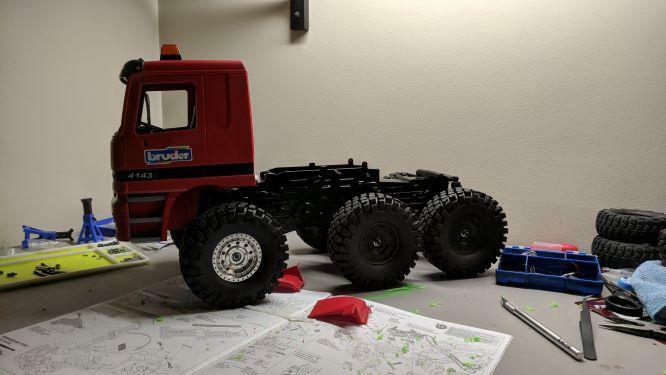 I think that the overall design will be a modern Dakar rig, I am taking some liberties and picking my several favorite features. 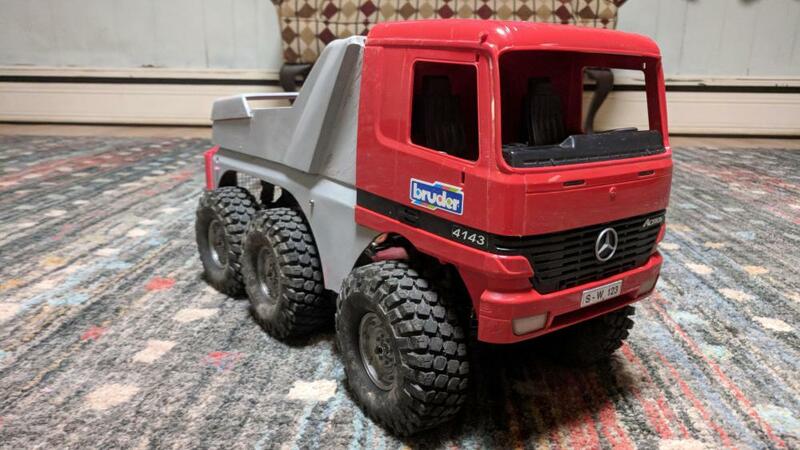 There aren't many Benz based trucks historically, much less 6x6's. May have been an easier choice if I had started with a MAN cab. These first two pics are linked from a scale model site, they were 1986 and year 2000 entrants. I find the below very interesting but complex and heavy. Here's a historical 6x6, doesn't really do it for me. Pardon the mess but here you can see the cage work I have done so far. Is strong enough and very light (mostly hollow) so quite at the start. Using all factory holes so no drilling required. If you look closely you can see two rails just outside the rear portion of the chassis which serve as the mounting points for the rest of the cage. I am trying out different ways to print a net for retaining the spare tires, it's not quite what I want yet. 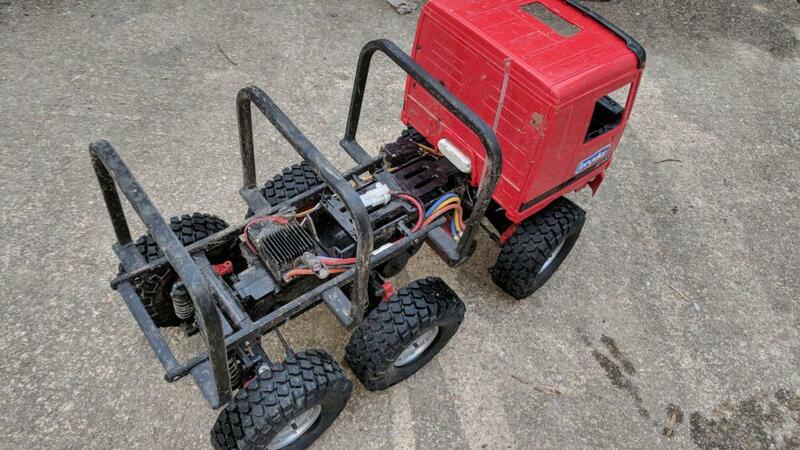 Also added a brushless, may try a slower one with a 20T to find a good compromise of control and speed. I have moved the receiver to under the cab on a little tray I made, the tray seals nicely with the inside of the cab to keep it relatively clean up there with good routing of the wires too. You can see the first version of the clear headlights mounted in the bumper, I need to tweak the CAD a bit and add bosses for led's. Ok, so this is a 2wd version but it’s what I’m basing mine on, maybe a few design ideas could be used on yours? Thanks for the share, that's pretty glorious. You say you are doing one as well, got a thread? I have the formers all done for the box, I'm going to try forming lexan for the sides of the box. Battery changes with the rear box are challenging. Have you worked out a method yet? I am printing some shorter formers (the hoops in the rear) presently. I’m only at the gathering parts stage at the moment, but I’ve been looking into it for months. I have no idea why but I’d never considered using hoops to support the rear body (seems quite obvious now though). I was considering making the rear panel either hinges at the top or halfway up so it can be flipped up for access & battery changes. After much back and forth and trying several things I have finally made some reasonable progress on the back half. 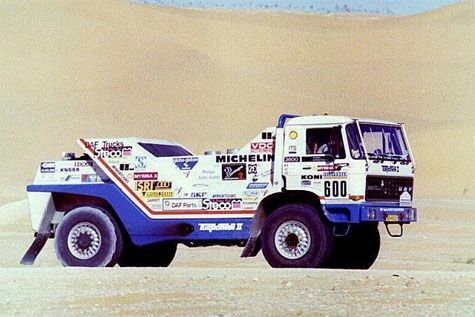 Sorry, no rally garbage truck, rather I have taken some inspiration from DAF TurboTwin X-1. Body is fitted. Needs a lot of sanding, filler and details. Printed from pink ABS filament and sprayed with some cheap red enamel just to check the look. I had hoped to design a cage that I could fasten Lexan panels to, perhaps in version 2 once my Fusion 360 skills progress more. I had been mostly stalled on this one for the past weeks. If anyone fancies giving it a shot I can provide the .obj files. Until then, here is where it sits. I was able to solve the problem with keeping the battery accessible without removing the shell. Will post some more pics as progress continues. I am not tied to the spare gas cans on the back. Just servo taped on for a bit of flair since I had them. Could also print a drop in bed in place of middle spare tire well, perhaps with random tools and things. Battery access is under the middle spare tire (above). Visible screws are temporary until replacement posts are installed. I am very please at this point. I will need advise on a front windshield I have flat .030 polycarbonate sheets though I don't know how I would pull one without a plug. 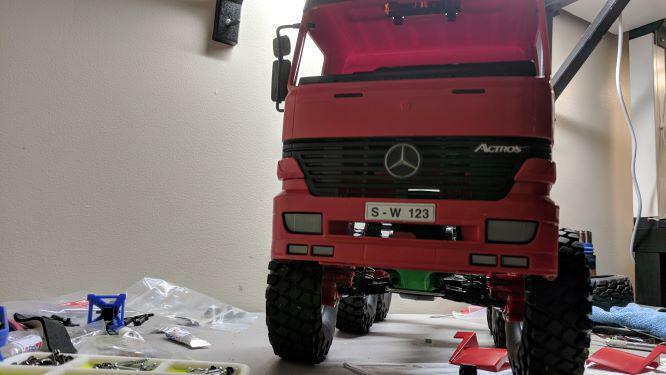 The Actros body does not come with one. Also need to settle on a paint scheme. I don't have a decal package in mind yet for livery. I do have limited off cuts from other kits but no overall scheme in mind yet. Not tied to a color yet either if any enterprising individuals wished to offer a suggestion. Screen Print Digital (on ebay) do a series of Dakar specific decal sheets - if you ask them nicely (like I did for the STUMPkamper) you can get them to change the numbers to the Truck Category (5xx) and also scale them slightly smaller (eg. 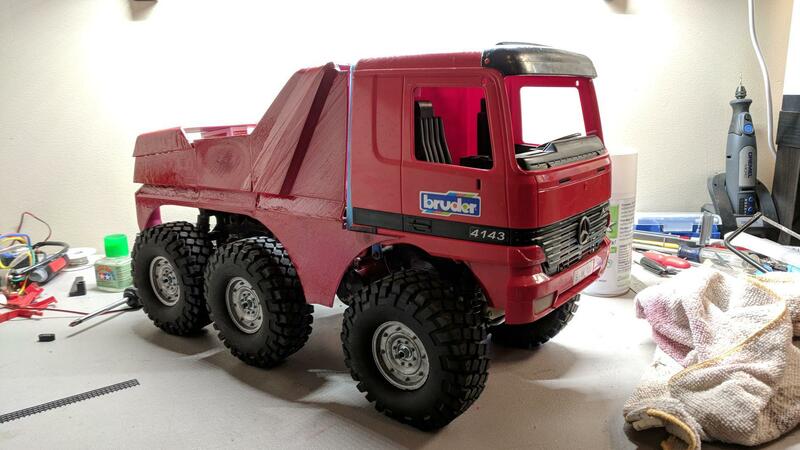 1/14th) to fit the panels on the truck more accurately. 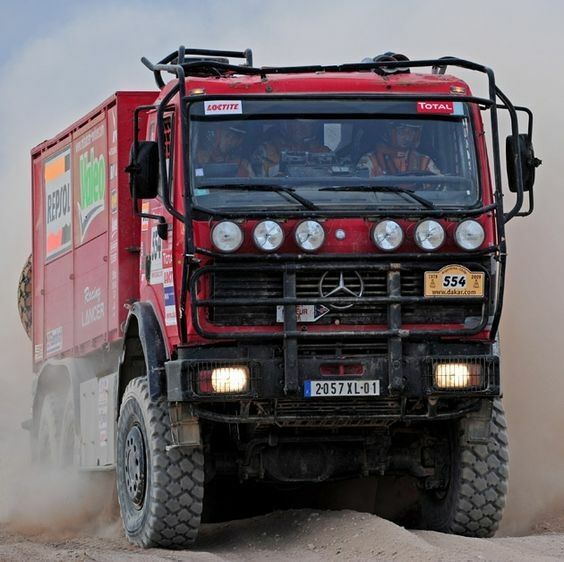 As for a colour, anything goes really - depending on the sponsors... Red Bull is a bit obvious really, although that always looks good - and the shape of the truck actually lends itself pretty well to the prancing bull and yellow circle? Being a Mercedes, then perhaps metallic silver as a base colour at least?